We will be taking part in National Mills Weekend again this year, we open to the public on 11 & 12 May from 10 am until 4 pm. There were a number of bone mills operating across Norfolk in the last century but the Narborough Bone Mill is the only site where substantial workings remain. When in operation the mill was used for rendering down into agricultural fertilizer bones from local slaughterhouses and from the whaling industry, with bones transported up the River Nar by barge from the blubber-processing factory at South Lynn. The mill stopped operating in the late 19th century, but the 16-foot diameter (4.9 m) waterwheel and the foundations of the main mill building remain together with underground sluices and two pairs of millstones. The Nar still flows through remains of the staunches and mitre gates. Site owner Beryl Munford bought the then disused Narborough Maltings in the 1970s with her late husband Robin. The purchase included 1.5 miles of riverbank and the bone mill site. 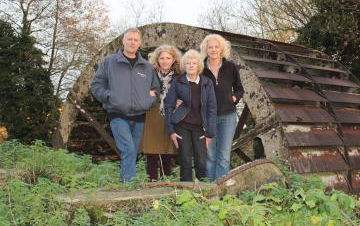 Robin had an ambition to restore the wheel and would be thrilled that his son, daughters and grandchildren are heavily involved in the project.